I am a huge fan of Elena Ferrante, the Italian novelist whose true identity isn’t publicly known and who has written some of the most interesting pieces of contemporary domestic fiction. Ferrante is best known for her Neapolitan Quartet (which is fabulous and is being adapted by HBO). 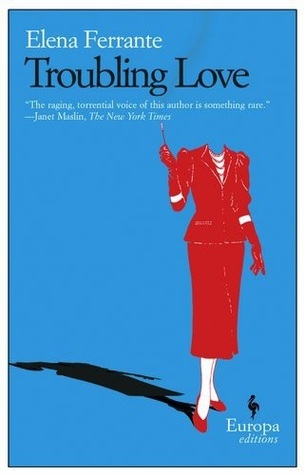 Recently, however, I had the opportunity to read one of her stand-alone novels Troubling Love. In Troubling Love, after a personal tragedy befalls the main character Delia, she returns to her native Naples to discover long lost secrets about her family. What follows is a fascinating self-discovery which explores the themes of love, loss, and the true meaning of family. I devoured this one in just two sittings (it’s only 139 pages long), but so much insight was packed into this thin novel. Between the heartbreaking emotions and the amazing setting details, this was such a richly rewarding book. I am so intrigued by Ferrante and the mystery surrounding her. She’s been quoted, “I believe that books, once written, have no need of their authors.” Still, her anonymity combined with the power of her prose makes me want to know more about her as a human being. Maybe it’s because I’m also an author, so while I agree with her quotation, I also feel that there’s some inextricable bond between an writer and her words.